Woodworking projects sometimes inevitably require a lot of nails, especially large wood framing or projects such as deck building, house framing, fence building, and other major carpentry work. Before, you would only find a framing nailer in the hands of woodworking professionals. However, with the surge in DIY enthusiasts, people from all walks of life are making good use of these nail guns. If you are reading this, you are probably among the many looking for the best framing nailer on the market. We'll walk you through our choices for both pneumatic and cordless models and the knowledge you’ll need to purchase the one right for you. 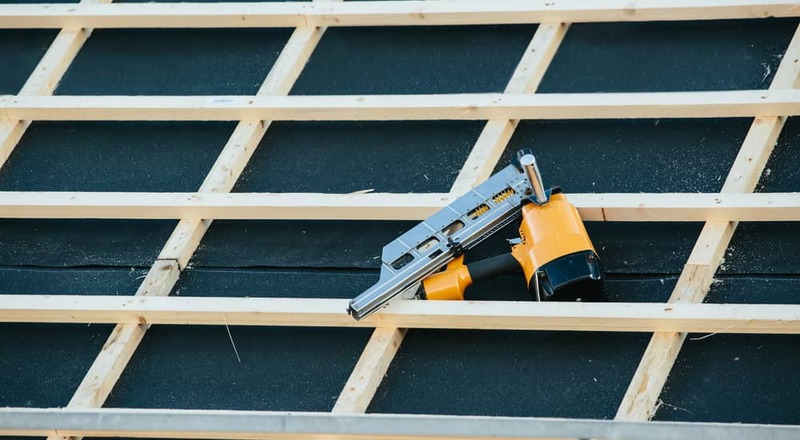 What is a framing nail gun and who is it for? 20.2" x 6.5" x 14.7"
20.2" x 6.5" x 14.2"
18.5" x 5" x 15"
Our Top Pick for the Best Pneumatic Framing Nailer is the Hitachi NR90AES1 Framing Nailer. It accepts 21 degree angled plastic collated and round head nails that are between 2 inches and 3.5 inches long. It is also fitted with a tool-less depth adjustment feature which allows the user to set the required depth for the nails. With options to change between sequential and continuous driving modes, two-step nail loading, and an ergonomic non-slip rubber grip, the nailer is an asset that not only promises but also delivers. 14.5" x 4" x 12"
13.9" x 4.3" x 14.3"
13.5" x 5.4" x 13.5"
15.5" x 6.8" x 18.5"
15.2" x 5.7" x 14"
Our Top Pick for the Best Cordless Framing Nailer is the Paslode 905600 CF325Li Cordless Framing Nailer. It features a 5-hour lithium-ion battery, long enough for experienced individuals to shoot thousands of nails. Despite being quite pricey, you will get a hard plastic carrying case, safety glasses, a battery, hex wrench and charger alongside the nail gun. 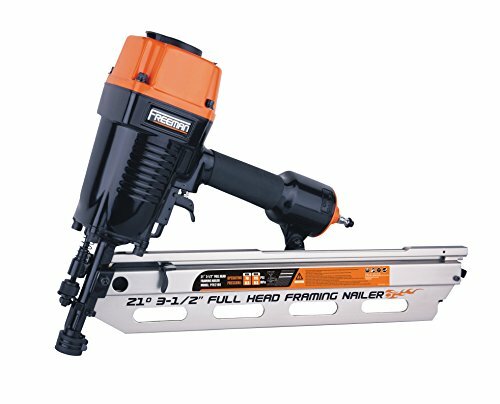 Fastener Length: 2" to 3-1/2"
Dimensions: 20" x 4" x 12"
The Hitachi framing nailer is designed with an improved head guard that allows for quicker and easier disassembly. This saves the user their valuable time while disassembling the tool for maintenance and checks. It also boasts of a lightweight and well-balanced design for ease of maneuverability. The lightweight design also ensures less fatigue for the user. With a selective actuation option, the tool allows the user to change between sequential and continuous driving modes by flipping a switch. The nailer also features a two-piece anodized aluminum magazine that makes repairs and replacement works easier. It also features a two-step nail loading option that allows for easier and faster nail replenishing. The product also ensures maximum comfort and a secure grip since it’s designed with an ergonomic non-slip rubber grip. The Hitachi framing nailer works with plastic collated nails measuring from 2” to 3 – ½” in length. Easy and quick nail replenishing. It is fitted with a non-slip handle for secure holding. Doesn’t have an adjustable exhaust. The NuMax 21-degree framing nailer is designed to offer versatility. This is because it can be used for a myriad of applications like framing, sheathing, fencing, and deck work. The nailer boasts of a lightweight design which guarantees extended use. With a one-piece drive blade, the tool ensures to offer increased durability. 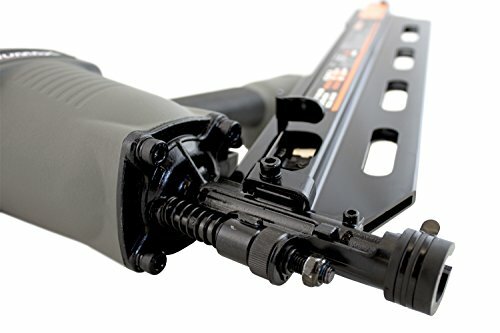 The product also features an easy to load magazine with a simple pull-back pusher which makes reloading easy and fast. The nailer is also designed with an anti-dry-firing feature which reduces damages on internal components. It is also ideal for bump and sequential firing since it has a dual-mode trigger that allows the user to change the modes. The product also ensures increased control and reduced fatigue for the user, thanks to its comfy grip handle. Also, the tool is designed with a 360-degree adjustable exhaust. This allows the user to direct the air away from debris or their face. Adjustable exhaust (up to 360 degrees). Doesn’t have a rafter hook. The Bostitch 21-degree framing nailer is an ideal tool for anyone looking for a lightweight yet efficient tool since it features a lightweight magnesium design. The tool also guarantees durability thanks to its magnesium housing. It also features an adjustable rafter hook which allows the user to hang it on joists and rafters. The product is designed with a patented push button as an adjusting depth guide. This allows the user to set the nails to desired depths. The product is also versatile since it is designed as a two nailer in one. This is because it has two quick change nosepieces that allow the user to convert it to either metal connector applications or framing nailer. Easy to control the length of the nail with a push button. Doesn’t have anti-dry fire mechanism. The tool features a durable construction which means it requires less maintenance. The product also has an adjustable rafter hook that gets out of the way when it’s not needed. The nailer is also designed with a soft grip handle that ensures maximum comfort for the user. It also has a compact size which allows it to fit between 16” o.c. studs, joists, and rafters. Durable construction ensures less maintenance. No tool-less depth adjustment or mode change. This Freeman nailer features a bump and sequential firing trigger which translates into versatility. It is also designed with an anodized aluminum magazine and cylinder which ensures its lightweight and added life expectancy. The product also boasts of high performance and internal sustainability since it is fitted with a one piece drive blade. The benefit of it having an anti-dry fire mechanism is that it prevents empty fires. The tool is also fitted with a removable no-MAE tip which prevents damage to the working surface. The blow molded carrying case it comes with ensures the product is mess-free and portable. Comes with a blow molded carrying case. Has anti-dry fire lockout mechanism. Does not have an actuation mode selector. Does not offer tool-less jam clearing. Nail Length: 2" to 3-1/4"
Dimensions: 14.5" x 4" x 12"
The Paslode 902600 CF325Li Framing Nailer is cordless providing users with utmost convenience and versatility. It allows you to sidestep the compressor weight at the expense of this little weighing and powerful machine. The product features a lithium-ion battery that provides plenty of working time on a single charge. Despite being made of plastic, this framing nailer feels super solid and doesn’t cheapen its overall feel. Another great feature of this product is the quick charging time. It only takes 1 hour, thus you can continue using the gun on site without having to down your tools if you run out of power. The tool comes with a one-year manufacturer’s warranty and a 2-year service promise. The other intriguing feature of this tool is the heavy-duty and well-crafted nosepiece that allows users to toe-nail at any angle. It features a nice coated handle that lets users make use of the tool for long hours without developing blisters. Nail Length - 2" to 3-1/2"
Dimensions – 13.9" x 4.3" x 14.3"
This product is a cordless nailer, giving users all the portability and convenience they need. You will like the extensive nail diversity offered by this framing nailer. Users can shoot more than 1000 nails without any jams. You can also use varying nail sizes, such as 3.5 – inches and 2.25-inches without any issue. This product can work for up to 4 hours, that gives users enough time to work on their basic DIY projects without having to recharge it frequently. You can do large jobs without dealing with dead batteries in the process. The indicator light alerts users of the low battery thus preventing unexpected downtime periods. The dry-fire lockout mechanism provides for fastening preventing possible damage to the tool and working surface. Dimensions – 13.5" x 5.4" x 13.5"
The unique air spring drive system makes use of compressed air to drive nails at an increased speed with zero ramp-up time. The brushless motor feature allows for a longer run-up time, increased durability and less maintenance. The other essential feature is the selective actuation that provides for an easy transition between bump fire mode and sequential mode when rapid nailing is required. It drives up to 400 nails per charge with its compact 3.0Ah battery ascertaining extended usage period. The tool comes with a tool-less depth of drive adjustment that provides for a professional finish with varying materials. The dry fire lockout mechanism works expertly in preventing the nailer from driving nails when fasteners are low for additional safety. The pivoting rafter hook provides for easy storage when you don’t need the nailer. The Hitachi NR1890DR Cordless Framing Nailer comes with a safety feature that allows it to turn off after 30 minutes of inactivity. Dimensions – 15.5" x 6.8" x 18.5"
The nailer features a brushless motor and an engine design that provides sufficient power to drive 3.5” nails effortlessly. It comes with sequential operation mode that provides for precise placement alongside the bump-operating mode that allows users the tool with exceptional production speed. The other intriguing feature is the dual speeds that optimize the motor use for different nail lengths. Like other framing nailers, it comes with an easy to access nosepiece for easy removal of jammed nails if it occurs when in use. The trigger lock-off feature allows for the trigger to be disabled when not in use to prevent damage to the tool and working surface. Another crucial feature of this framing nailer is the stall release lever that resets the driver blade quickly. The tool accepts 30 to 34-degree paper nails with a top cap that it impact resistant and easy to remove for troubleshooting needs. 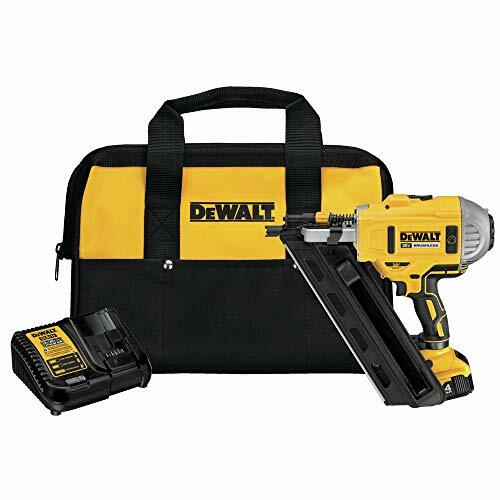 Dimensions – 15.2" x 5.7" x 14"
Like other framing nailers, it features brushless motor and engine design with two speeds for optimized performance. The stall release lever resets the driver blade in case the tool jams when being used. With easy set-up and clean-up taking less than 20 minutes, this cordless nailer saves on cost compared to gas-powered nailers. This Bostitch BCF28WWM1 Cordless Framing Nailer nails 3.5 inches with a 2-speed motor and tool-less depth adjustment and selector that allows for an easy change between sequential and bump fire modes. The other intriguing feature is the powerful battery with an in-built gauge that allows you to check on the charge before you start using it. It features an easy to adjust nail depth on the front, a key feature that makes it easy for users to adjust the depth without using any tool. The tool has a switch for changing power between short or long nails. The short nail settings allows you to save power. With this, ensure that you use the long nails when there is plenty of power. It is recommended for those who use Hurriquake (NF) disaster resistant nails. It’s gradually replacing the need for a hammer in a wood workshop. Although I’ve seen some veteran carpenters trying to frame a building and they literally hammered 16d nails in just one swing or two swings. Amazing right? How many years of experience do you think I need before I will be able to hammer like them? Get me a framing nailer and I will match them in minutes. I’ll be firing my third nail before they think of swinging their hammer. It can save your muscles some unnecessary stress and take hours off your project. So, it is for you if you want to move from being a rookie framer to a pro in a matter of minutes. There are two types: cordless and pneumatic framing nailers. The first one operates solely on battery power. It’s similar to how pneumatic nailers work except that it uses a sealed compressed air cylinder to fire nails, unlike pneumatic nailers that use external air compressors. Basically, anytime you pull the trigger, the compressed air drives the piston to fire the nail into the wood. Some other models use a flywheel system in which the motor stays at a high speed to drive the nail into the wood. This refers to the angle the nailer’s magazine makes in relation to the ground when the nailer is held upright. The greater the angle, the easier it is for users to access places that are hard to reach. Similarly, as the angle increases, so does the cost of operating the machine as the nails become more expensive. A 21-degree angle is perfect if you work with the machine in an upright position. However, for those who frequently work within tight spaces, consider a machine with a 30-angle magazine. This is also a great advice when choosing the best fininsh nailer 15ga. Stick magazines use long striped nails. Besides, the capacity of stick models is lower compared to coil magazines due to their arrangement. Nonetheless, it is due to this arrangement that stick models have an even weight distribution thus balances better compared to coil nail guns. Coil magazines take nails joined together with wires, arranged in flexible strings. They hold more nails compared to stick models and their design makes them to fit tight spaces compared to guns with stick magazines easily. Sequential actuation mode allows the nail to fire one nail every time the trigger is pressed. The bump mode, on the other hand, allows users to fire several nails in succession. You can get both by going for a machine that allows switching between the two modes. This switching system is very common in most of the nail guns like the best brad nailers on the market. As the name suggests, this determines how deep the tool drives the nails. This mechanism varies from one framing nailer to another. Consider getting a framing nailer that provides for a deep drive adjustment. In some instances, the nail may derail from its alignment jamming the nailer. When such happens, you will need to clear the machine before using it again. This process requires a lot of tools and can be sometimes daunting. Amidst this, you can find nail framers that have tool-less clearing. A dry fire is a term used when a machine fires without nails. This occasionally damages the machine and working surface. Having a nail gun that has an anti-dry fire mechanism that prevents the framer from actuating is of immense importance. Understanding the parameters that relate to nail selection should be among the first considerations when searching for a nail for a framing nail gun. Of most importance, you must look into the three vital aspects of a nail, the nail length, type of collation and type of nail head. Nail length, check the size of nails that the nailer will accommodate. Carpenters prefer a cordless frame nailer that accommodates 3.5-inch nails. The nail head type is the second aspect. Two main head types determine your nailer selection. They include round head nails and clipped heads nails. Both types require different firing mechanisms. Clipped type occupy less space and its cartridges carry more nails per inch compared to round head cartridges. This increases the carrying capacity and saves on cost. However, clipped head nails aren’t as strong as round head nails. Nail collation. This refers to the way manufacturers use to hold nails in a cartridge. There are three common methods, namely paper, plastic and wire weld. Unlike pneumatic framing nailers that rely on compressed air, cordless nailers rely solely on batteries as their power source. 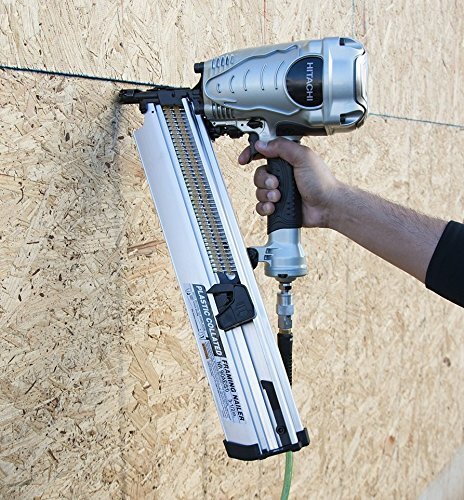 Gas powered framing nail guns, which are not very common, can also be classified as cordless frame nailers as they don’t have a cord linking them to power source. Cordless framing nail guns bring about utmost convenience as users can take them anywhere provided that batteries have some charge in them. Besides, you don't have to drag weighty air compressors around as well as the worries of tripping over a cord. Additionally, since there are no air compressors, you won’t suffer the additional costs incurred with corded framing nailers. However, cordless models are more expensive than pneumatic models. Generally, the cordless models require less maintenance. Note that the presence of a battery makes them quite heavy and results in more downtimes as you recharge them. That said, cordless nailers are appropriate for those looking for a portable nail gun for use in different work sites. All woodworkers who hate dragging air compressors around can also find this tool perfect. If you don't mind using compressors, then pneumatic models are right for you as they are cheaper. 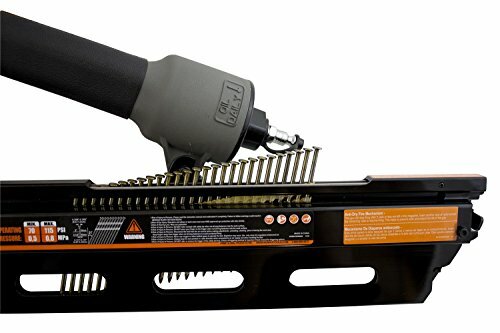 A quick note here, depending on the type of work you are doing, especially interior work such as crown molding, working on your cabinet and furniture, etc... it can be very handy using a nail gun air-powered like the best 23 gauge pin nailers on the market. However this is the subject of a different conversation. You can never be too safe when handling or operating a framing nailer. Any slight error could result in serious injury. Below are some tips to ensure your safety while using your tool. Read your tool’s instruction manual: Reading instruction manuals could be very boring right? Spending some time to read it will not hurt rather, you’ll learn about the tool’s applications, limitations, and possible hazards. Take care of your work area: Don’t work in areas that are cluttered, slippery or filled with dust. Also ensure the area is well lit so to avoid mistakes when nailing because driving a nail into another nail might cause a spark. Keep children, pets and untrained persons out of work area especially when the tool is operating. If you’re working in a workshop, always lock up when you’re leaving. Use Personal Protective Equipment: Everyone in the work area including visitors should wear safety goggles, ear protection, and safety gloves. Always dress properly when operating the tool. Loose clothing, jewelry or long hair can be caught in moving parts. In order to keep your framing nailer in top working condition, you need to take proper care of it and service it regularly. Below are some tips to ensure that your tool is in good working condition. Wipe the external part of your framing nailer clean with a soft clean cloth to remove dirt, dust, oil, and grease before and after use. You can use mild solvents to aid the cleaning. Most plastics are prone to damage by commercial solvents. Never soak your framing nailer in cleaning solutions, it can damage the internal parts of the tool. Lubricate any moving parts of your tool periodically to reduce wear and tear of the machine’s parts. Don’t store your framing nailer in temperatures below freezing, doing this might lead to premature tool failure. Don’t allow petroleum-based products, penetrating or harmful chemicals to come in contact with plastic parts of your framing nailer. Harmful chemicals can weaken or damage plastic and might result in personal injury. Always inspect your tool from time to time to check for damaged parts, misalignment of moving parts and for loose parts. A lot of accidents are caused by badly maintained tools. A framing nailer can help you frame a house or repair your wood project quickly. It’s not just about shooting nails into wood blocks, there are some instructions you have to follow to be able to complete your woodwork easily and in no time. You’ll need a framing nailer (of course), framing nails, personal protection equipment and the wood you want to nail. ​Put on your safety gear which include safety goggles, ear protection, and hand gloves. A dusk mask might also be necessary if you’re going to be working in a dusty environment. Ensure you’re within a safe working environment free from children and pets before you start. A framing nailer is not the kind of tool you play with so you have to be extra vigilant when using it. Engage safety anytime you’re taking a break or away from the tool for any reason. ​There are different firing methods such as bump nailing and trigger nailing. Bump Firing: This involves holding the trigger down continuously while you push the safety contact down against the surface of the wood. A nail is fired every time the nozzle comes back in contact with the wood after recoiling. To ensure the effectiveness of this method, you need a nailing line to guide you. This method of firing is very fast but it does not offer much control over firing function. You could accidentally push the nozzle against the wrong place on the timber. When using this firing method, make sure the nailer is not mistakenly dropped, a nail might be fired and could hit someone or something. Trigger Firing: This method of firing is safer than bump firing. The nailer fires a nail only when you pull the trigger. With this level of control, it’s very unlikely you drive a nail into the wrong place. However, the first method earlier discussed is a little faster than the trigger firing method. This is a type of nailing in which a nail diagonally between two pieces of wood that meet at a 90-degree angle. Load up your framing nailer with suitable nails into your nailer’s magazine. Place the nailer’s nozzle at a 45-degree angle against the studs and fire the nail. You need to line up the nail with the studs so the nail goes through both without the nail shaft bulging out. ​In this type of nailing, you have to align two studs side by side and fire a nail straight from one side of the studs at a 90-degree angle. Repeat the process on the other side of the stud to make a strong connection. ​Never point the framing nailer at yourself or anyone around you even if it’s not loaded. Also, don’t place your hand too close to the board you’re nailing because you can mistakenly injure yourself. Q: When to use framing nailer? A: Use a framing nailer for large wood framing or projects such as deck building, room construction, house framing, fence building, and other major carpentry work. Q: Cordless or pneumatic framing nailer? A: Pneumatic framing nailers use an external attached compressed air cylinder to drive nails while cordless brad nailers use either a spinning flying wheel or a sealed compressed air cylinder to drive nails. If you don’t like a hose being attached to your tool all the tie, then you should opt for a cordless framing nailer. However, cordless framing nailers are usually costlier and heavier than the pneumatic ones. A: Framing nailers with higher angles allow reach into tighter spaces/ angles when you are framing. There are three major framing nailer angles which includes 21-degree Framing Nailers, 30-degree to 34-degree Framing Nailers and 28-degree Framing Nailers. The 30-degree to 34-degree Framing Nailers can reach into tighter spaces than the 21 and 28-degree Framing Nailers. A: Yes. It’s possible if your framing nails are long enough to attach the siding tightly to the wood sheathing. A: It’s better you get a roofing nailer for the job because framing nail’s heads aren't as wide as a typical roofing nail’s head but they can still be used to hold down roofing sheet. A: Absolutely! A framing nailer is a good choice for your fencing job because it was designed to nail large pieces of wood together. A: A Coil framing nailer sometimes known as a roofing nailer is also a pistol-shaped tool that helps you drive nails into pieces of wood. They don’t use regular roofing nails rather they use special coil nails. Switch off the framing nailer before oiling to prevent cases of accidental startups. Reload your nails back into the magazine and continue your work. 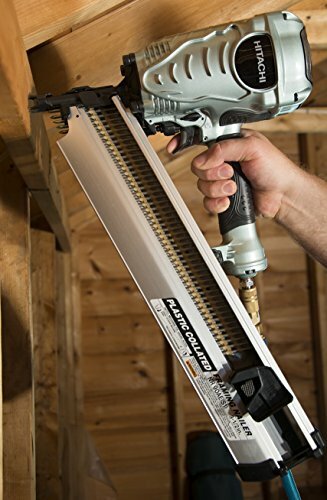 A: A typical stick nailer can accommodate two sticks carrying between 25 and 45 nails each while coil nailers have an adjustable magazine that can accommodate up to 200 framing nails at a time. On the other hand, Coil nailers are not as popular as stick nailers and a fully-loaded coil nailer can be very heavy especially if you’re using it for overhead works. According to our research the Best Pneumatic Framing Nailer is the Hitachi NR90AES1 Framing Nailer. It's a good choice for the price besides the powerful nail framing ability. Our top pick for the best electric battery powered nail gung is the Paslode 9025600 CF325Li Cordless Framing Nailer . Besides being cordless, it comes with a tool-less depth adjustment, adjustable nosepiece and a one-year warranty. You will also like its quick charging time with a durable battery for lengthy usage period. That said, whereas pneumatic framing nailers are powerful, the cordless models comes with the benefit of convenience and portability.